David Cleveland is a human ecologist who has done research and development project work on sustainable agrifood systems with small-scale farmers and gardeners around the world, including in Bawku (Ghana), Oaxaca (Mexico), Zuni and Hopi (southwest USA), North-West Frontier Province (Pakistan) and Santa Barbara County (California, USA). 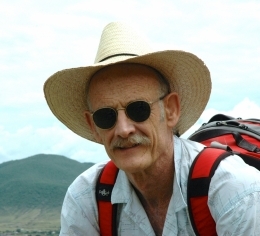 He earned a Ph.D. in ecological anthropology from the University of Arizona, and his research and teaching focus on sustainable, small-scale agrifood systems, including plant breeding and conservation of crop genetic diversity, local and scientific knowledge and collaboration between farmers and scientists, climate change, nutrition and food sovereignty. In addition to teaching in the Environmental Studies department, he is an affiliated member of Geography; Ecology, Evolution and Marine Biology; and Anthropology. He is currently researching the potential for agrifood system localization to improve nutrition, reduce greenhouse gas emissions, and strengthen communities in Santa Barbara County, California and the US; and on the genetic, ecological and sociocultural impact of genetically engineered crop varieties globally. His latest book is Balancing on a Planet: The Future of Food and Agriculture.